Personal: Last name pronounced “faw” (rhymes with raw)…Native of Guelph, Ontario. 2018: Finished in tie for eighth in FloBowling PBA Wolf Open...Finished 17th in GoBowling! 60th Anniversary Classic and Xtra Frame Wilmington Open. Career: In 2017 had best finish of fourth in U.S. Open losing to Wes Malott 186-179 in second stepladder match...A week after finishing 171st in 2016 USBC Masters, won the Barbasol PBA Players Championship in his first PBA Tour event, becoming the first Canadian ever to win a PBA Tour title…Made his second PBA Tour final in the 2016 PBA Fall Swing Badger Open where he finished third after losing to eventual winner Sean Rash 224-205 in semifinal match...Owns five PBA regional titles. 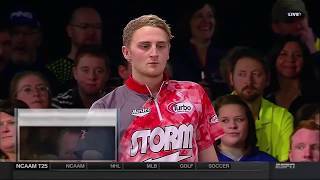 2016 - Barbasol PBA Players Championship. University…2015 second team All-American…2015 Intercollegiate Team Championships MVP with runner-up Urbana University…Three-time member of Team Canada...2018 Central Region Player of the Year.